New client? Already a client? Brandon and his wife Jenn have a natural love of animals and their home life reflects that of most of our clients; a home with multiple pets who are full members of the family. While taking care of his 2 Husky dogs and 2 cats Brandon manages to find time to work both as an entrepreneur and as a pet sitter/dog walker. He is the main caregiver for our daily walk and play clients and has many happy customers who love to talk about what a great job he does with their pets. He is comfortable with all dog breeds and has had numerous dog training classes. Brandon also has large aquariums and spends time breeding and watching his fish. Click here to schedule your pet sitting appointment: Potty & Play Break, Overnight Sleepover or Dog Walking session now. 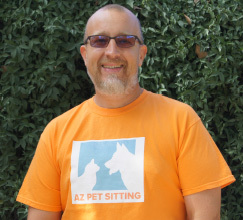 Arizona Pet Sitting’s online booking feature is simple, convenient and real-time. Making your appointment online puts you in control, and helps us know and understand your pets’ needs, and assures you that your dates, times and instructions are accurately communicated. The best part is you can check your pet sitting dates anytime you wish. Our favorite treats made right here in Phoenix. Check out Charlie's Doggie Bag here. Our customers receive a special discount. Ask us how to get yours! We have an exclusive relationship with Hotel Palomar. Hotel Palomar is a pet-friendly hotel in downtown Phoenix. Email Us - We Love Pets! Serving Phoenix, North Phoenix (within the Valley communities of Scottsdale, Peoria, Glendale, Paradise Valley) – please call to confirm.